Garlic is a well known herb. Garlic (Allium sativum) is one of the best known herbs around the world. This perennial plant, most often grown as an annual, produces edible bulbs composed of a number of cloves. It is generally agreed that garlic evolved from the wild garlic A. longicuspis. The exact origin of garlic is unclear; it grew wild in a large area from Siberia to India to Egypt to Central Europe and spread through southern Europe. It is still cultivated in most Mediterranean countries today. Garlic probably developed in south-central Asia, in the “garlic crescent” that ran from the Black Sea east through the southern Caucasus Mountains of Georgia, Armenia, and Azerbaijan, beyond the Caspian Sea in the Kopet Dagh Mountains of northern Persia (Iran) into southern portions of Uzbekistak and Turkmenistan, to the Hindu Kush Mountains though northern Afghanistan and on through Tajikistan and Kyrgyzstan, the Pamir Mountains and the Tien Shan Mountains of China. The rugged foothills of these various mountain ranges of the Himalayas are probably the true birthplace of garlic, although it was known in all early civilized cultures, including the Babylonians, Egyptians, Romans and Chinese. In addition to its culinary attributes, garlic has many healthful benefits. Regardless of where it actually came from, this member of the onion family has been cultivated for thousands of years for both culinary and medicinal uses. Of course, everyone knows that garlic repels vampires; garlic consumption in fact does repel mosquitoes. Garlic has also been promoted to treat colds, coughs, high blood pressure, arteriosclerosis, fungal infections, cancer, hyperglycemia, high cholesterol, roundworms and hookworms. Proponents advise eating a raw clove of garlic a day to boost the immune system. Recent scientific studies have shown that certain compounds in garlic prevent blood clot formation and may affect blood cholesterol levels. Allicin in the bulbs has antibiotic and antifungal properties. Garlic’s volatile oil contains many sulfur-containing compounds – although not as much of the sulfuric acid that makes your eyes water as onions have – that are responsible for the strong odor, as well as for its healthful benefits. Recent studies have shown that some of these sulfur compounds may be potent inhibitors of the cancer initiation process. Medicinal activity seems to be highest in fresh garlic or garlic oil with a high allicin content. Allicin, which has antibiotic and antifungal properties, is made by the enzyme alliinase that breaks down alliin to allicin. 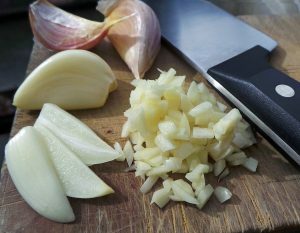 Heating or cooking garlic inactivates the enzyme, but chopping 10 minutes before cooking will allow allicin to form. Garlic is a perennial that grows in spring and goes dormant by late summer. Wild garlic came from areas with a harsh continental climate of hot, dry summers with intense sunlight and long cold winters. It would mature in late spring, then stay dormant until the cooler, moister fall and then begin another cycle of root growth. In early spring shoots would spring up rapidly, and plants would form bulbs and complete their growth before the soil dried out and the scorching sun arrived. 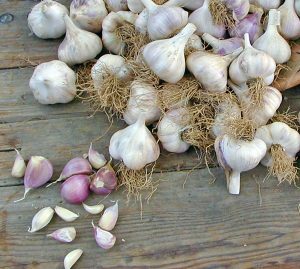 When it was moved to the Mediterranean and continental Europe, garlic had to adapt to year-round rain, cooler summers and/or milder, wetter winters. This exposure to a variety of climatic conditions probably led to the diversification of varieties we have today. There are hundreds of varieties of garlic. Garlic taxonomy is a mess, with even the experts confused about the true relationship of the hundreds of different varieties, partly because the characteristics of garlic varieties are influenced by the local environment. And the common names given to many varieties are not really indicative of their true origins. For example, the name “Italian” has been applied to many varieties only because Italian immigrants brought them here, not because they originated there. Garlic rarely flowers, forming bulbils instead. Garlic is only propagated from the bulbs, since it has lost the ability to produce fertile seeds – some varieties don’t even produce flower stalks or flowers. The numerous varieties available today are presumably the result of random mutations. Garlic varieties can be broadly categorized as either hardneck (subspecies ophioscorodon) and softneck (subspecies sativum). Hardneck garlic has a woody stem in the center of the bulb. 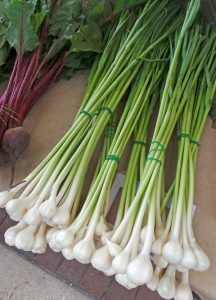 Rocamboles (R) are the most commonly grown hardneck garlics, having exceptional flavor. There is some confusion with the term ‘Rocambole’ because it has also been applied to another Allium species, A. scorodoprasum. 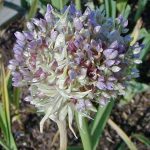 Rocambole garlics have dark green or blue green leaves, a moderate spreading shape and a tightly coiled flower stalk with one to three loops. The bulbs are off-white with various amounts of purple blush or streaking, and 6-11 plump, dull colored, easy-to-peel cloves. Because they begin root growth in the early fall, they generally have a limited season of 3 to 4 months before quality deteriorates in storage. Porcelain (P) garlics are not very common in North America. They are taller than Rocamboles, with pale to deep green leaves and looping or irregularly coiled scapes. The bulbs are a satiny white with only 4-6 large cloves that are more difficult to peel than the Rocamboles (but easier than softnecks). These types store longer than Rocamboles, for 4 to 8 months. Their flavor is often mild at harvest but intensifies during storage. 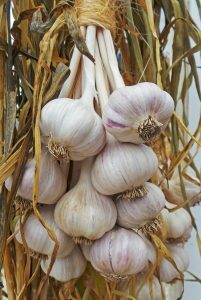 Purple stripe, a hardneck garlic. Purple Stripe (PS) or purple streaked garlics have bright purple streaks and blotches on both bulb wrappers and clove skins. They are also very flavorful, with most having 8-12 cloves. These types store slightly longer than Rocamboles and peel just as easily. The leaves on the plant grow at wider angles to the stem than Rocambole types do, and the scapes often make perfect 270 degree curls. Artichoke (A) garlics are fairly upright plants with average to slightly pale green leaves, rarely with a flower stalk (occurs occasionally in some climates or on some individual plants). The bulbs are white and the cloves are generally milky white, with some having a pink or brown blush or partial striping. The skins adhere tightly, making them difficult to peel. There are two layers of cloves, with the inner ones tall, thin and narrow and plump, squarish outer ones. The flavor is variable from mild to hot, depending on strain and climate. 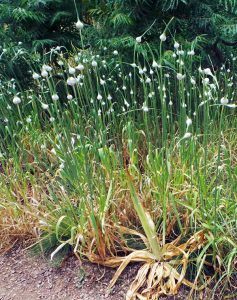 These are the most adaptable garlics and the types grown commercially in California. 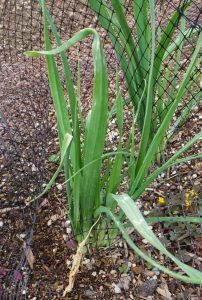 Silverskin (S) garlics often have pale green leaves, rarely make a flower stalk, and produce white or pink blushed bulbs with either 8-12 or 18-24 cloves, depending on type. They perform best in mild winter climates and vary in flavor from very mild to very hot. Elephant garlic is a different species than true garlic. Elephant garlic (Allium ampeloprasum) is not a true garlic – it is actually a type of leek. The extremely large bulbs with 5-6 cloves can weigh as much as a pound. The flavor is much milder than true garlic, but a sharp or bitter taste sometimes develops in cold climates. Most commercially-produced garlic is grown in mild areas of California, centered around Gilroy (“The Garlic Capitol of the World”) in southern Santa Clara County and in the San Joaquin Valley. The varieties grown there, such as ‘California Early’ and ‘California Late’, do not adapt well to our colder climate, and if they grow at all, they usually develop a very hot flavor. Planting cloves from garlic purchased at the grocery store is not recommended. Over the years many other varieties that are much better suited to cultivation in cold climates have been selected, and they often have better garlic flavor than the types grown in mild climates. However, varietal characteristics (from flower stalk formation to taste) can vary from location to location, and renaming cultivars grown in different areas is not uncommon, so selecting appropriate varieties can be difficult. ‘Brown Tempest’ (PS) – brown cloves with a hint of rose blush and no stripes. The purple splotched bulbs average 6 cloves. It has a fiery flavor when eaten raw, but that mellows to a pleasing aftertaste. It stores longer than many hardnecks. ‘Chesnok Red’ is just one of many garlic varieites that does well in Wisconsin. ‘Chesnock Red’ (PS) – a good performer that holds its shape and retains flavor after it is cooked. Purple-striped wrappers hold 8-12 cloves. Hot, zippy flavor mellows in storage. ‘Georgian Crystal’ (P) – large clean white bulbs with 4-7 cloves and mild but robust flavor. It has a mild flavor even when eaten raw so is good in dishes such as pesto, salsa, etc. ‘German Extra Hardy’ (P) – from Central Europe, with 4-7 big, full-bodied, spicy white cloves. Best used raw, as most of the flavor is lost in cooking. ‘Giant Siberian’ (PS) – large white bulbs with 5-7 purple-striped cloves. ‘Inchelium’ or ‘Inchellium Red’ (A) – vigorous with mild taste, but the 10-20 cloves can be difficult to peel. It stores well, with the flavor becoming more pronounced over time. 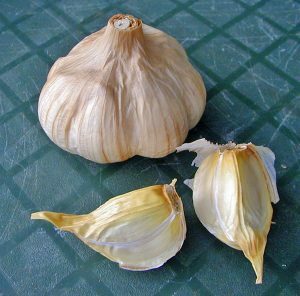 ‘Italian Late’ (A) – tight, light colored wrappers surround fat outer cloves with rich garlic flavor. Stores 6-9 months. Can be planted in spring. ‘Killarney Red’ (R) – is better adapted to wet conditions than most others. Produces 8-10 pink skinned, easy-to-peel cloves. ‘Korean Red’ (PS) – produces 4-8 large purple cloves in purple-striped bulbs. The big cloves are easy to peel and have a very hot flavor. Stores for 6 months or more. ‘Music’ (P) – large bulbs with pink skin similar to ‘German White’ and robust flavor. ‘Polish White’ (P) – large cloves inside the purple-striped wrapper. ‘Russian Red’ (R) – 8-11 reddish brown cloves with strong flavor. Very easy-to-peel cloves. Stores for 6 months. ‘Silver Rose’ (S) – rose colored cloves are enclosed in smooth, bright white wrappers. Stores up to 8 months. Can be planted in spring. ‘Spanish Roja’ (R) – large cloves peel easily and have more subtle flavor than many other Rocambole varieties, and is quite good eaten raw. 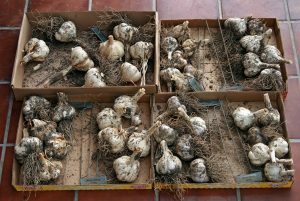 Bulbs with 6-11 cloves store 4-6 months. Garlic needs full sun to yield well. Garlic does best in full sun in well-drained soil high in organic matter. Bulb expansion can be impeded in heavy clay soils, especially if they dry out. And supplemental moisture may be needed early in the season on light, sandy soils. Prepare the soil well before planting to provide a loose growing bed for bulb growth. In Wisconsin, garlic should be planted in later summer or fall, usually within a week or two after the first killing frost. This will allow the roots to develop and shoots emerge from the clove but not grow above the soil by the first hard freeze. 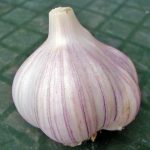 A period of cold is necessary for bulbing, so unless given a proper cold treatment prior to planting, most garlic varieties planted in the spring will produce weak shoots and poorly developed bulbs. Artichoke types do not seem to need winter cold as much, so these would be most suitable for spring planting. Spring planting should be done as early as possible to allow bulbs to form. Garlic left in the ground will start to develop new roots from each of the cloves during late summer. The amount of garlic to purchase will depend on the area to be planted and variety (certain varieties have more plantable cloves per bulb than others). Generally, there are about 50 cloves per pound of cloves, although the average gardener isn’t going to be using that much. Single bulbs are offered for sale by many retailers. Also, locally-produced bulbs sold at Farmer’s Markets or obtained from small growers can also be used. Separate the individual cloves from the bulb just before planting. Choose the largest cloves since they generally will produce the largest bulbs. The large cloves of some hardneck varieties are “doubles” (actually two cloves fused together) which will produce two bulbs that become flattened as they grow together. Place the cloves pointed side up, 2-3” deep and about 6” apart. Cloves planted too shallow are prone to injury during the winter and early spring. Mulching with 3-4” clean straw after planting will help minimize soil temperature fluctuations that can damage the developing roots and shoots. Remove the mulch in the spring after the threat of hard freezes has passed; it can be replaced after the shoots are about 6” tall to help control weeds for the remainder of the growing season. Plant the individual garlic cloves with the pointed side up (L), as this is where the shoot will emerge (LC). The basal plate at the bottom is where the roots will emerge (RC). Place the bulbs several inches deep in the soil (R). 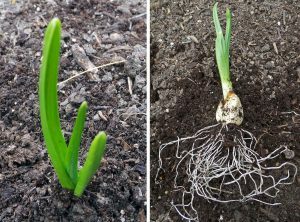 Fertilize garlic when the shoots are 4-6 inches tall (L). Even though there is little foliage, there is a large root mass (R). 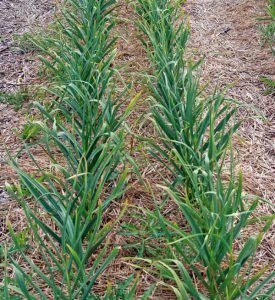 Garlic is a moderate to heavy feeder, so apply a nitrogen fertilizer at planting and again when the shoots are 4-6” tall. The leaf tips of many garlic varieties develop yellow tips even when soil fertility is adequate – often because of water stress – but unless it occurs early in the season before bulbing, this won’t affect yield. Garlic has a relatively shallow root system and is sensitive to moisture stress, especially during bulbing (about the end of May to mid July). Lack of water will result in smaller bulbs and earlier maturity. Provide supplemental irrigation if rainfall is not adequate. 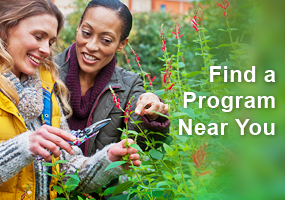 Stop watering when the foliage begins to wither to avoid stained bulbs and diseases. 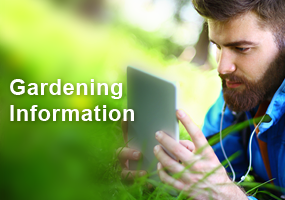 Mulch will help control weeds and moderate soil temperature. Control weeds by shallow cultivation or mulching, as garlic is a poor competitor and bulb size will be reduced. Mulching will moderate soil conditions both during the growing season and during the winter. Any pesticide and weed seed-free material of moderate texture, such as fresh grass, chopped straw or pine needles, can be used. Avoid heavy mulches that may prevent the soil from warming up in the spring, may keep wet soils from drying out, or could prevent moisture penetration into the soil. Be cautious with wet leaves, fine sawdust or uncomposted manures that may actually form a barrier to the soil below. 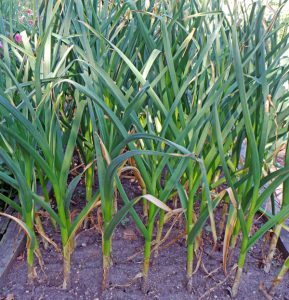 The scapes of hardneck garlic can be removed just after curling starts, since yield can be reduced up to 30% when grown in poorly fertilized soil (but less than 5% reduction in well-fertilized soil). However, there is some circumstantial evidence that leaving the scape on until it turns woody may improve storage life. 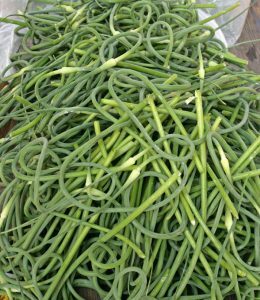 Garlic scapes can be removed, but if the plants are well-fertilized leaving the scapes intact will not reduce yield. 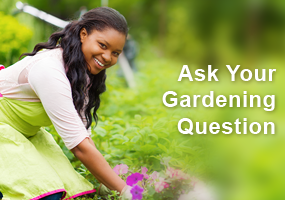 Garlic has few insect or disease problems in the home garden. Various fungi can cause decay in the ground and/or storage, but using clean seed, planting at the proper spacing to allow good air circulation, and proper storage after harvest will reduce the potential for disease development. Knowing when to harvest garlic can be difficult. Knowing when to harvest is a little tricky, since different varieties mature at different times. Harvest too early and the small bulbs will not store well; harvest too late and the cloves may pop out of their skins, making them susceptible to disease. Harvest time is less critical for softneck varieties than hardneck varieties, as they are less likely to split open in the ground. Unlike onions, garlic doesn’t signal maturity by breakdown of the neck tissue. In general, garlic is ready to harvest when half of the leaves have turned brown. You can dig a couple of “test” plants to make sure their cloves fill the skins. The Artichoke types generally mature first, followed by the hardneck types, and finally the Silverskin garlics. Allow garlic bulbs to dry in a well-ventilated area for a few weeks to cure, then clean. Dig the bulbs with the shoots still attached. Loosen the soil underneath the bulb and carefully pull up the entire plant by the shoot. Knock off the soil and allow to dry in a well-ventilated room. You can leave the tops intact or cut them down to a few inches above the bulb at this time. After curing for 3-4 weeks, the roots and remaining shoots should have dried down. Cut the tops to ½-1” above the main bulb and trim roots close to the base of the bulb. Clean the bulbs by removing the outermost skins and brushing away any remaining soil. It is best NOT to wash the bulbs, as the moisture could encourage disease. Garlic stores best as whole bulbs; cloves separated from the parent bulb deteriorate more rapidly than whole bulbs. Store garlic bulbs in a cool place to prolong storage life. Generally, hardneck garlic can be stored for only 3-4 months at room temperature without significant deterioration in quality, while softneck garlic generally can be kept at room temperature for 6-8 months. Storing hardneck garlic at 32° will extend storage life up to 7 months; higher temperatures will cause sprouting and higher humidity will promote rooting. If you intend to use the garlic for seed to replant in your garden, store at room temperature until planting. Fresh garlic is used in many cuisines throughout the world. Garlic is a practically ubiquitous culinary herb used in a wide variety of cuisines throughout the world, especially French, Italian, and Chinese. It is an essential ingredient in the classic Provençal dish Chicken With 40 Cloves of Garlic, aioli (garlic mayonnaise), and the Italian Zuppa di Agliatta (roasted garlic soup). Garlic goes with just about any savory food and is a critical element in many sauces and dressings. It can be used to flavor butter, vinegar, or oil, and its distinctive flavor enhances meat, vegetables and other dishes. With a little imagination it can even be used in desserts! Garlic fudge may not be for everyone, but any garlic-lover should try this once. Garlic offered for sale in markets throughout the world (L-R): amid other vegetables in Peru, tubs of bulbs and separated cloves in Thailand, hanging braids in Nicaragua, and huge pile in Madagascar (behind basket of onions). Garlic can be purchased dried, as dehydrated flakes, in powder or as garlic salt, or as canned purée, but none of these forms can compare in flavor to fresh garlic. Garlic loses pungency with cooking, so it is often used raw or added at the last moment to heated dishes when an intense flavor is desired. Sautéing is probably the most common and easiest method of cooking garlic, bringing out its nutty, savory taste and mellowing out the flavor. But be sure to stir constantly – garlic burns easily and then turns bitter. Whole cloves can also be poached (simmered in water, wine or other liquid) to produce a more delicate taste and preserve their shape. Roasting garlic brings out the nutty flavor, mellows hot, spicy varieties and adds an almost caramelized quality to the garlic. Roasted garlic makes a fabulous appetizer or squeeze the warm pulp out of the cloves and spread on bread, add it to mashed potatoes, or into sauces. Whole cloves can be tossed with vegetables or into salads, or even baked into bread. 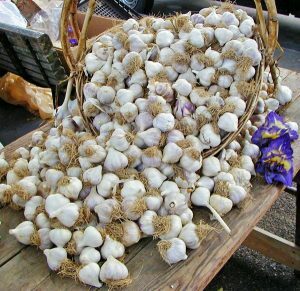 Young garlic, with mild-flavored, immature bulbs, can often be found at Farmer’s Markets. Mature bulbs and cloves are the most common form of garlic sold, but green and young garlic is sometimes offered at farmer’s markets. Green garlic, harvested in the spring, has tender leaves that can be used just like green onions, but with a mellow garlic flavor. Young garlic is harvested in early summer with immature bulbs and a stem that is usually too tough to eat. The flavor of these bulbs is generally milder than that of the mature bulb, so is especially good for using raw. Use the scapes as a vegetable before they get woody. Immature garlic scapes can also be eaten raw or cooked, whole or chopped as a vegetable. They should be harvested when still curled and before the flower buds develop; when straight or the flowers are out, they are woody and inedible. They have a mild but unmistakable garlicky flavor and can be used the same way as garlic in any recipe. Garlic scapes make an unusual addition to stir-fries or fried rice, can be used in a variety of garlic scape recipes, or are used to make pesto (substitute garlic scapes for up to half of the greens and proceed as usual). They keep for weeks in in a plastic bag in the refrigerator, or can be a very unusual addition to a flower arrangement! And for those who really love garlic, there are numerous garlic festivals throughout the country – and the world. At most of these events you will find garlic flavor in almost everything from wine to soap and meats to desserts, as well as freshly harvested garlic, garlic seed direct from local growers, garlic crafts, garlic lectures and cooking demonstrations, and garlicky entertainment. 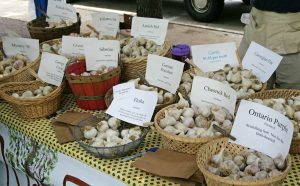 One of the most famous is the Gilroy Garlic Festival (gilroygarlicfestival.com) that celebrates the local mass-grown commercial crop the last weekend in July. Another large festival is the Hudson Valley Garlic Festival, in Saugerties, NY (hvgf.org) but there are many others (see www.everfest.com/food/garlic-festivals). And should you wish to travel far from home, consider attending the Festivalul Usturoiului in Copalau, Romania – Dracula’s homeland – to celebrate garlic in late July. Just bought garlic at Inga’s Farm ( Around the Farm Table on PBS). Glad to have read these planting tips especially choosing the largest cloves to plant. This article was quite helpful; a lot of information. I read it last year when I first planted “Inchillium Red” and “Music” but now I have a few more hints for even better planting and harvesting this coming season! A local organic grower sells the bulbs at our farmers’ market this time of year so I plan to try a couple more varieties. My favorite this year, for its taste and texture, was “Music”. I did not know that elephant garlic was actually a leek nor that we should wait to plant until after the first killing frost. I have been planting mine before any frost and shoots are sometimes 6″ tall before winter. This year I will wait. I have always been intrigued by garlic and this article really opened up my eyes to understanding it much better. Thanks for much for sharing it. Interesting article. Garlic has a lot of benefits in addition to adding flavor to food. Good article! I was unaware of the great number of varieties of garlic or even the hardneck/softneck distinction. The wide variety of purported medicinal uses of garlic was also quite interesting. Very interesting plant. Lots of variety and was interested to learn of all the medicinal uses. Like that it repels mosquitoes! Excellent article. Never thought about growing garlic as I thought it would be difficult. After reading this informative piece, I am going to give it a try. This is a great article! I have hardneck cloves ready to go into the ground as soon as it is cool enough. This article has given me great information to put to good use! I was unaware of the medicinal values of garlic and how many varieties there are. I will be waiting to plant it until after the frost. This is wonderful information and I plan to print a copy. It was interesting to learn all the health benefits. Especially the idea that garlic is promoted to combat high cholesterol. I did not know that. I really enjoyed this article and plan to refer to it often. Very interesting article. I am in my second year of growing garlic and will incorporate some of the ideas I learned here. I loved having the Wisconsin recommended varieties listed. I had no idea there were so many types of garlic, nor had I ever heard of the flavor being referred to as “hot” – we always referred to it as strong or mild. I like to mix garlic plants in my annual pots – the height it gets make an interesting arrangement. I haven’t tried cooking the scapes, but see them at the farmer’s market – maybe I’ll give them a go next spring! After reading this, I will make a space in my small garden for garlic next year. I know that garden onions are more flavorful than store bought. I wonder if fresh garlic will also be tastier than the typical store bought/shipped. I also learned how to store garlic from the article. Good to know about the many different varieties of garlic and that the soft ect types can be braided. I have purchased those at the farmer’s market. this sounds like a good topic for a presentation at one of our meetings!! Any presenters out there?? I didn’t know much about garlic it would seem. Great article. Very informative. Thanks. 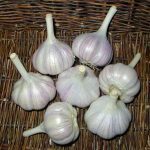 “Garlic needs a proper cold treatment prior to planting, most garlic varieties planted in the spring will produce weak shoots and poorly developed bulbs. I planted my garlic in the late summer and left it in the ground over the winter. I must have done something wrong because it was not there the following spring. I did not know that garlic consumption repels mosquitoes. Also, I didn’t know that garlic’s oil contains sulfur compounds which may inhibit the cancer initiation process. I found both statements to be very interesting. I PURCHASED GARLIC BULBS FROM A NURSERY A FEW YEARS AGO AND HAD NOT IDEA WHAT KIND I HAVE. MINE DOES RESEED ITSELF, SO I HAVE A GOOD SUPPLY, WEATHER I REPLANT OR NOT. YOU COULD HAVE ADDED THAT IF YOU DO NOT REMOVE THOSE SEED HEADS THEY WILL RESEED THEMSELVES. GOOD ARTICLE. I didn’t know the difference between hard neck, soft neck and flavors! Good read. I never grew garlic, but plan to try it. I haven’t used cloves of garlic in my cooking in the past so it will be fun to try it out now. First of all, I never realized that there were so many varieties of garlic out there! Having boufht some at our local farmer’s market, I was delighted with the flavor. I will try my hand at it, and being mostly a flower gardener, this will be a really fun challenge. First of all, I never realized that there were so many varieties of garlic! Having bought some at our local farmer’s market, I was pleasantly surprised at the flavor of it, and the colors! I am tempted to try planting some this fall, and will head to the farmer’s market and speak to some of those growers for their advice about how to do this. As mostly a flower gardener rather than a veggie gardener, this sounds like a really good challenge! I was told to plant garlic before the first frost. I’m glad I read the article and will be waiting until after the first frost to plant. Also will mulch with straw. This will be the first time that I’ve planted garlic. 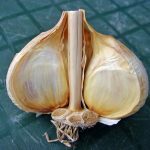 This article captured my interest as I have been growing garlic for about 7 years for SSE (Seed Savers). While I have both hard neck and soft neck varieties, I prefer the flavor of the hard neck. The bulbs definitely grow larger in our cold winters and I had to chuckle when I read how temps affect the flavor/heat of garlic. How much hotter can garlic get in Wisconsin winters, right? Maybe that is why I get somewhat of an up-set stomach eating raw garlic! I have eaten garlic scapes, but I have never harvested them purposely when they are immature, nor did I ever think of using them for flower arrangements. Last but not least, I might have to try adding them to wine for a subtle hint of flavor in next years ‘Open Class’ at the Outagamie Co Fair. Thanks for some food-for-thought on garlic! Garlic should be planted a week or two after the first killing frost. Neutral to slightly acidic is best, but not essential. Most soils in Wisconsin are in the suitable range.